FLORIDA --- Expressing extreme frustration with the flatness of their home state, Floridian Adventists are leaving en masse for what they call "End Times reasons." They blame the lack of mountains to which to flee in the Time of Trouble for the exodus. "We are hands-down, the flattest state in the nation," said one of the relocation leaders, Sayo Nara. She explained that it was "biblically irresponsible" to continue living in a state that was not conducive to rapid mountain escapes. "This is a great state for tanning and oranges but good luck hiding from the bad guys on the beach," said Nara. Wow, this is silly. Congratulations on writing pure poppycock. You should apply for a job writing something elegant and meaningful, such as rap lyrics. There is always the swamps and the Glades. After all what are a few gators and skeeters? Florida is flat except around Waldo & and an area near Keystone Hgts. Some old Indian caves, but not enough for the fleeing SDA’s. You gotta drive way up 75 to Dunlap, Tenn. Very isolated there. Many retired SDA’s find solace in Dunlap. Check it out. Me, I’m aheadin’ for the Desert of Maine. LLBean sells survival stuff. I will be fully camouflaged. Only the Angels will find me. Who’ gonna join me? 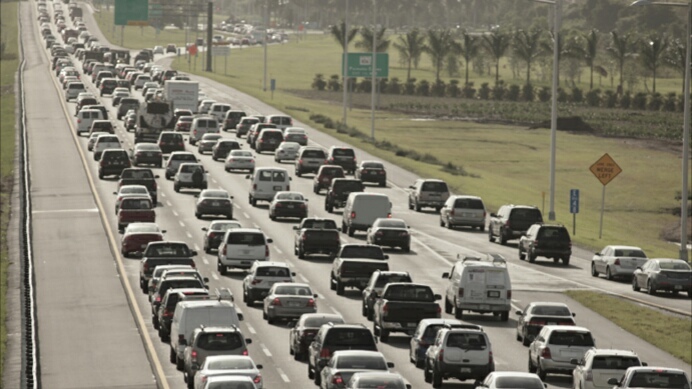 Is the photo of SDA’s leaving Florida Hospital heading north & east on I-4? Hey, Dis. That’s a real photo. I am in the red car under the green highway sign. We left the Florida Conf. office, head out 436 to I-4 east heading up to the Blue Hills of Virginia & safe hiding among my moonshiner friends.